This is a COVER REVEAL! But the other day, out of the blue, a reader let me know it’s already out there. Oh well, I will be all right. And I have been told (by the acclaimed author Justine Larbalestier) that I should just go ahead and reveal it anyway. So here it is! (See above.) It was designed by the talented Elizabeth Parisi, and I think it’s stunning. This is the third and final book in the Colours of Madeleine trilogy. 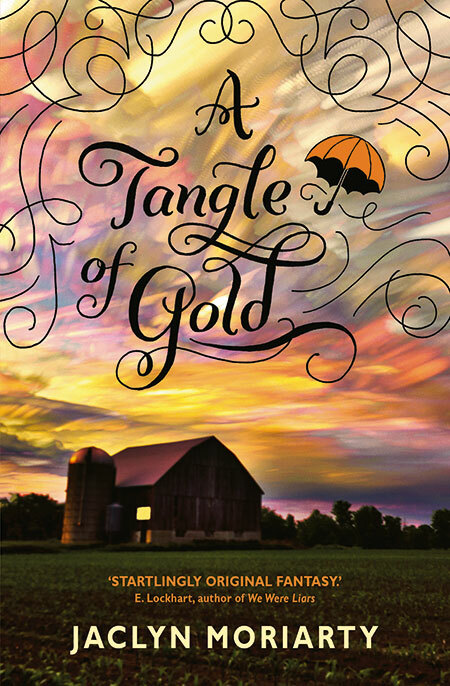 The title is A Tangle of Gold, but you will have guessed that if you looked at it. It will be released early in 2016. When I started my Colours of Thursday blog as a ‘countdown’ to the publication of this book, I thought it was due to be released any moment. This has been a good lesson for me, and has really made me think about such things as ‘attention to detail’ and ‘making reckless promises’ and ‘just how many Thursdays there are in a year’. On the bright side, you have plenty of time to read the first two books in the trilogy if you haven’t already read them. Actually, I think you should go and read them now. I’ll wait for you here. They’re called A Corner of White and The Cracks in the Kingdom. 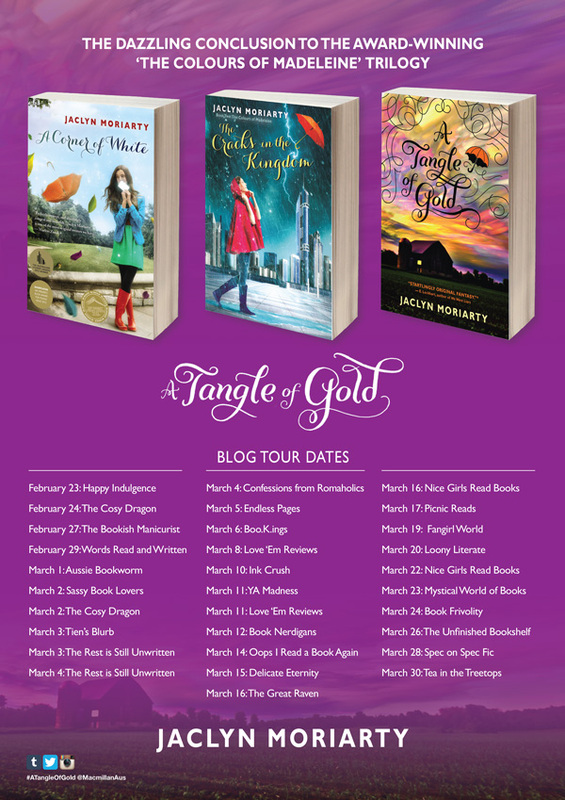 A Tangle of Gold opens with an extract from the Illustrated Travel Guide to the Kingdom of Cello. Here, for your interest, is that extract. Then, just when you’re not expecting it—just when you’re sniggering and turning to your books—the Cello Winds switch. Something surges forward like a sailboat on a wave; springs at your heart with claws of gold. The Wind finds its feet—or its wings, or its voice—and the music that it sounds! How to describe it? Exquisite does not even come close! Try this. I have a friend (Albert) who once suggested that the music of the Winds is ‘that elusive thing that lies beyond all beauty; the aesthetic heart and soul of grief and love.’ I’ll be honest, I often find Albert quite insufferable, but here, somehow, he almost hits the mark. Of course, the Cello Winds do more than play their music: They also blow away disease. In our Kingdom, no pestilence takes hold.